So, I had an excellent primary and a good secondary regulator. How come I decided to get the Apeks CTX 100, which I now use as my primary reg? Although I had to complete sets of regulators I still had to borrow an octopus regulator for the Mares Abyss, as I didn't want to connect the Spiro second stage to the Mares first stage for that purpose. Solution: To buy a Mares Octopus. To buy just an octopus is only slightly cheaper than to buy a whole regulator set. Solution: To buy a complete set. I wanted a set that was comparable in quality to my primary system. Solution: A second Mares Abyss. Mares had major problems at the time to deliver. Result: One less customer for Mares. The Apex TX 100 had already been earmarked in my first regulator buying round. Result: I got the follow up model CTX 100 including octopus AT 20! Well designed! The first (non swivel) stage (balanced diaphragm design) comes in an elegant matte metal finish and has two 7/16" high-pressure UNF ports, three low-pressure ports (3/8" UNF ports) and one 1/2" low-pressure port, enough to attach all necessary items. Low pressure is constant at 9,2 - 9,6 bar (depending on adjustment). The first stage has an integrated cold water cap and is certified for cold water according to the EN 250. The second stage is not quite as stylish as the Mares one, it is mostly made from black plastic. On the left side is a little metal screw to adjust the breathing resistance. Note: If the breathing resistance is set too low, there is the danger of an uncontrolled regulator free flow. At the right of this screw is a Kipphebel, to regulate the Venturi-effect. This gives the diver the opportunity to adjust the personal breathing level of comfort and even while diving fine tune it to ones personal needs. An additional metal heat exchange system helps to reduce the danger of a second stage freeze up. Tec-divers espesially like about the regulator that its second stage can be dismantled and cleaned even under water. Well, this is true, it should, however, first be practiced in a pool and should not be attempted if there's a current. Alternatively you could just take care that it doesn't fill up with dirt during the dive! When I first attached it to the bottle, a problem arose. In combination with the big Mares first stage it was near impossible to put both regulators into the valves. First I therefore had to adjsut my hose setup. Finally in the water I noticed something quite annoying: The CTX100 comes with an extremely short hose, aggrevated by the fact that with my setup (Apeks on the left valve) the first stage is 5-10cm further left than normal. The result is that the regulator drags the head slightly to the left. The only advantage is that in case of buddy breathing the buddy has to be so close that you could easily switch to proper mouth to mouth resucuration ;-) Hier also erstmal Minuspunkte in der B-Note. Apart from this, however, there's nothing to complain about! At any depth the Apeks CTX 100 delivers air easily and reliably. The ease of breathing doesn't quite reach the standard of the Mares Abyss (were you could easily switch to "passive breathing" ;-), but still beats most other regulators I've used so far. It is possible to adjust the Apeks to a near Abyss ease of breathing, but this very slight raise in breathing comfort comes with a much higher risk of regulator free flow. And in this case the amount of air going through the reg is high that the first stage quickly freezes up (aggrevating the problem) and that at a depth of 6m the pressure in a 12l tank drops from 220 bar to 20 bar within 3-4 minutes. In summary I think that the Apeks CTX 100 is a proper work horse, steadily and reliably doing its job. The problem with the short hose was solved by using a long hose (2m) to attach the second stage to the first stage. 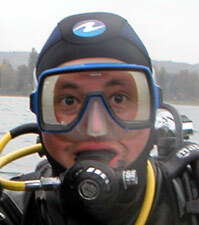 I therefore now dive with the long hose Apeks as a primary and the short hose Abyss as the secondary regulator. All in all a very good choice!